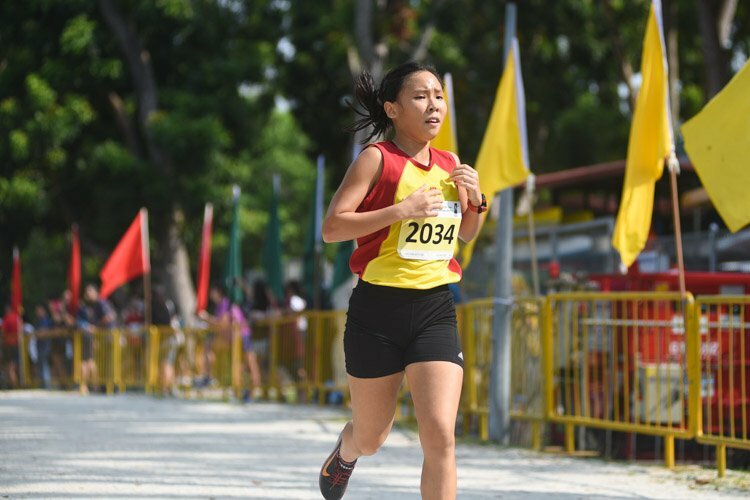 Story by Alyssa Almas/Red Sports. Photos by REDintern Jordan Lim. 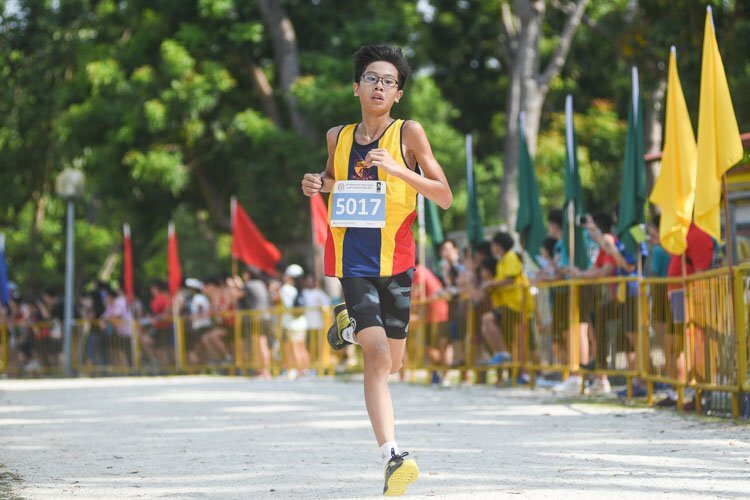 Millennia Institute, Monday, April 8, 2019 — It was a convincing win for Millennia Institute (MI) as they took on Hwa Chong Institution (HCI) in the preliminary round of the National Schools A Division Football Boys’ Championship. MI secured the win with three goals — two of which were scored in the second half. The match started off slowly, both sides unsure if the game was going to be called off due to the looming thunderclouds in the distance. 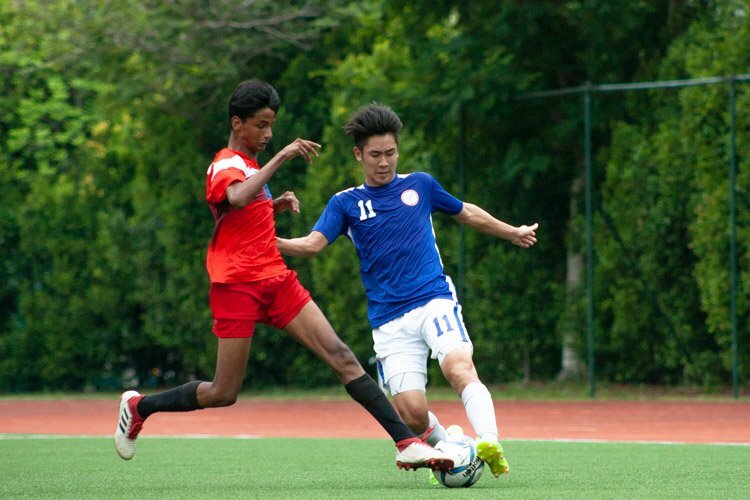 The previous match between Raffles Institution and National Junior College had ended prematurely at 74 minutes, due to the lightning alert. MI were given early opportunities in the game, having been awarded a corner in the fifth minute of play. However, nothing came out of it, as the ball was quickly cleared away by the HCI defenders. Another opportunity for MI came just six minutes later in the 11th minute in the form of a freekick. 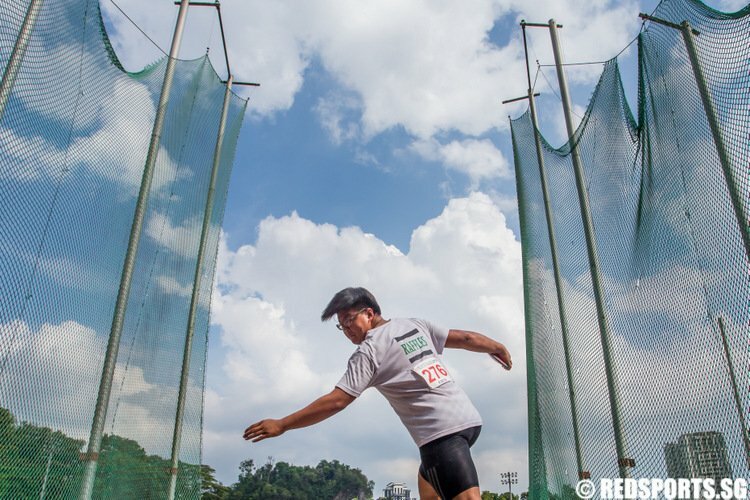 However, the header by Roy (MI #12) flew just shy of the far post. HCI had a promising break in the 20th minute when they were awarded a freekick from the midfield. 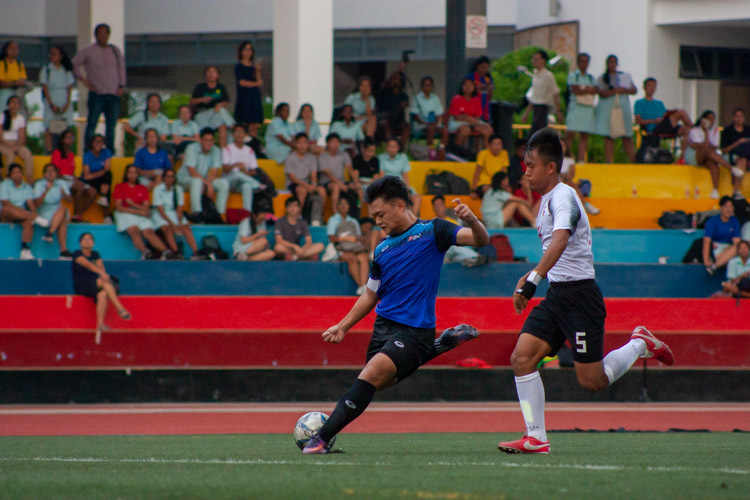 HCI captain Ong Kang Jun (HCI #10) stepped up to take the freekick, which flew dangerously at goal. The resulting freekick was spilled by a panicked MI keeper, but the MI defenders were alert and quick to defend. Just two minutes later, in the 22nd minute, MI scored their first goal through Amrin Taufan (MI #6). Amrin chested in a cross from Louis Chng (MI #14) and tapped in a low goal just out of reach of the HCI keeper. 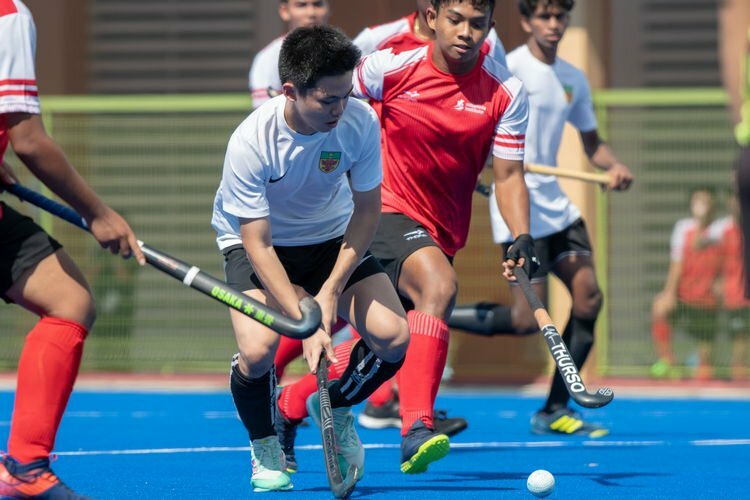 MI almost scored their second goal of the match just ten minutes later, when Ibrahim Halil (MI #7) dribbled past the HCI defense for a 1v1 with the HCI keeper, Tan Jing Xuan (HCI #1). 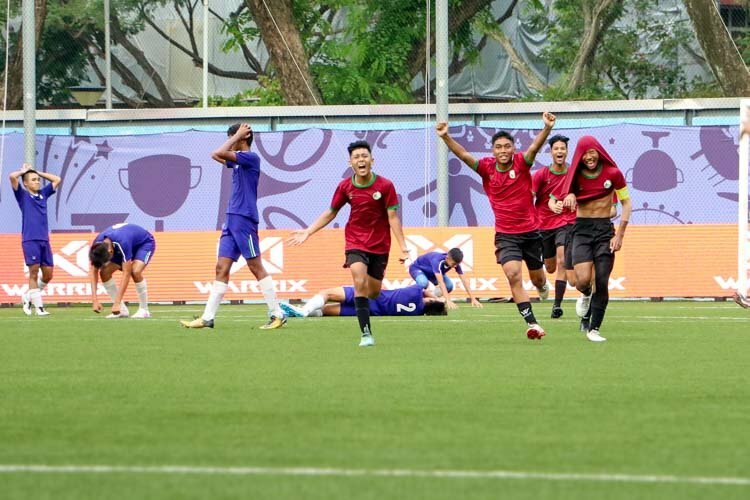 Ibrahim chipped the ball calmly over the keeper to what seemed like a definite goal, but HCI defenders soon swarmed the box, deflecting the ball out for a corner kick. At half-time, the score stood at 1-0. 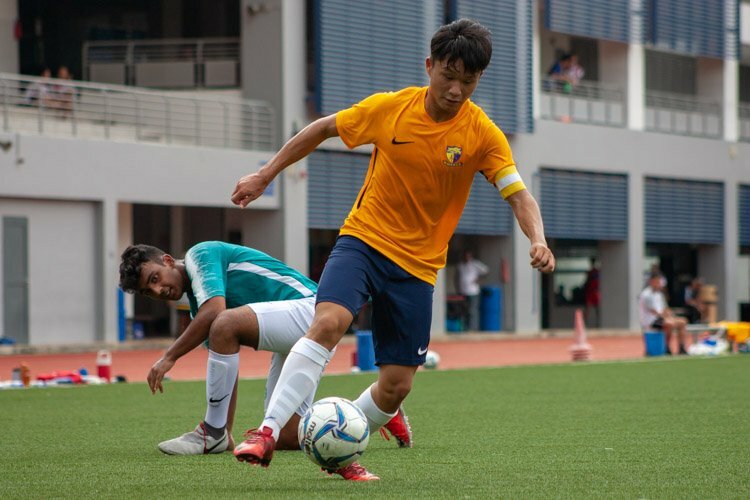 “(At half-time) I told my team that we were doing well, and to keep up the intensity, to fight for the result and most importantly to trust in each other while doing so,” quipped HCI team captain Kang Jun (HCI #10). 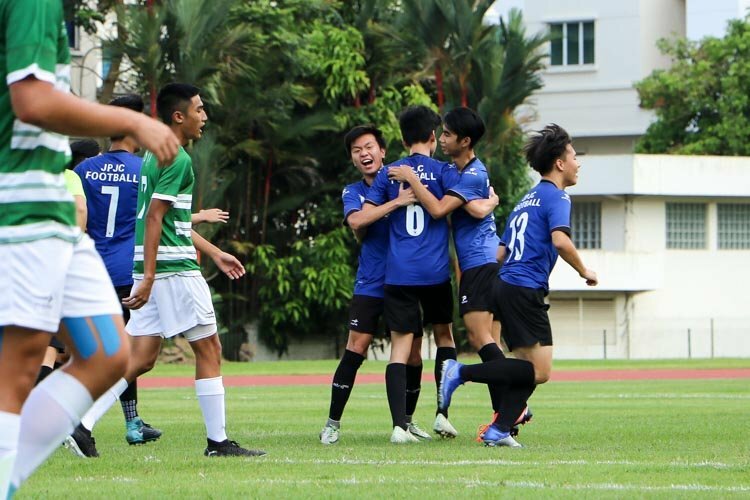 HCI started off strongly in the second half, almost scoring the equaliser in the eighth minute. 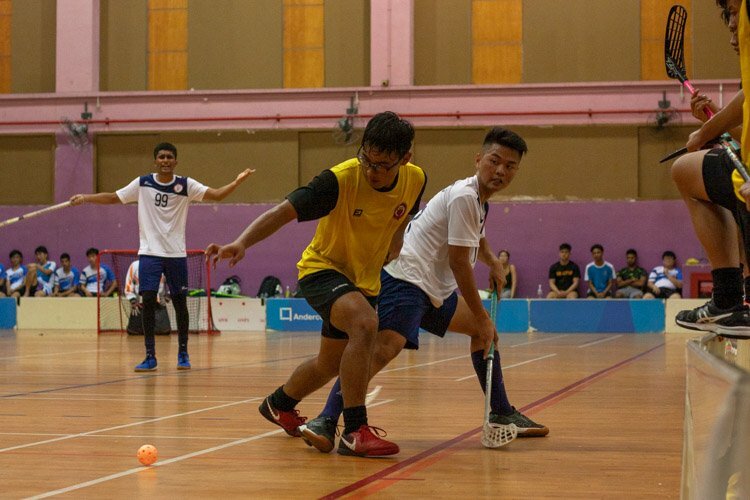 The break came during a HCI counterattack where Ethan Tan (HCI #13), fired a shot at goal. The ball was barely just deflected out by the MI keeper for a HCI corner. HCI looked a better team in the second half, stringing more passes together and playing more confidently. Despite better play by HCI, MI were still able to score their second goal of the game via a header by Louis (MI #14) in the 25th minute. It was an easy goal for MI, as Louis headed in the ball at close range into the back of the net, leaving the stunned HCI keeper helpless. With the match coming to a lull in the last 15 minutes, it seemed as though the game would end with a final score of 2-0. However, MI’s last stunner was reserved for the final two minutes of play. In the 38th minute, Zahier (MI #2) took a seemingly routine corner kick for an MI set-piece. 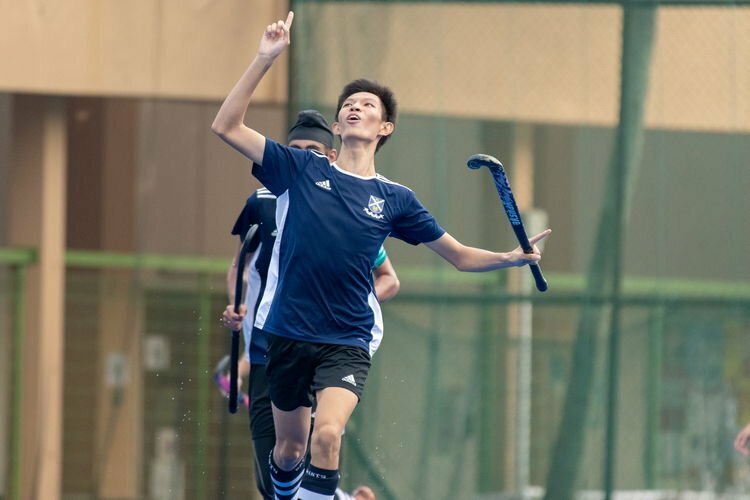 However, there was nothing that needed to be done as the well-taken corner curved into the goal, hitting the far post before bouncing into the goal, to thunderous applause and cheering from the MI players and supporters alike. With the sound of the referee’s whistle, the final score stood at 3-0. “I think that they’re definitely a strong opponent because of their great teamwork and effort on both ends of the pitch,” he said. 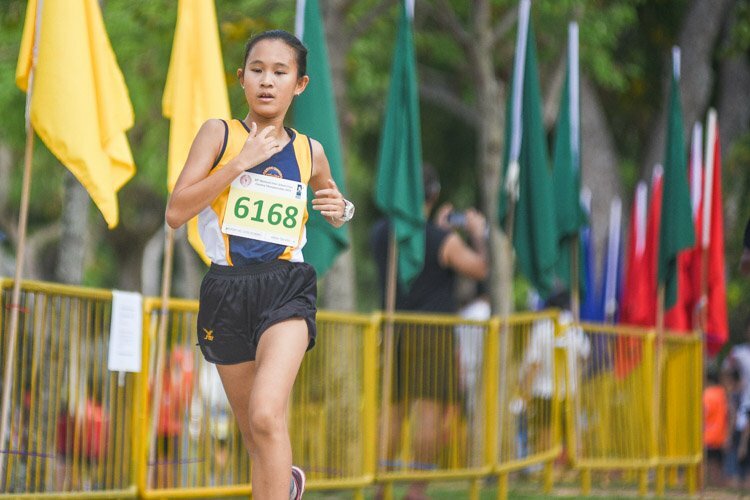 Millennia Institute are set to face Raffles Institution next, while Hwa Chong Institution are set to take on Temasek Junior College.